At first I was excited when I saw that this week's French Fridays with Dorie dish was a lamb curry. And then ... I read over the ingredients list. Figs. Apples. Honey. Golden Raisins. That's a lot of sweet components in a dish, even for one with supposedly Moroccan overtones. And to balance all this sweet fruitiness? Trace amounts of cardamom and a couple of tablespoons of Madras curry powder ... a mild curry seasoning if ever there was one. Plus - I'm sorry, Madras curry powder is fine, but I simply don't believe you can get a rich, deep flavor from a curry powder that comes in a tin. Needless to say, I had other ideas. Recently I received a review copy of Rice & Curry, a fabulous Sri Lankan cookbook. (Look for a giveaway in the coming weeks!) I have made quite a few dishes from it, and they have all been amazing. The star of each dish has been the homemade curry powders - each ingredient is roasted individually, and then ground together. It's incredibly aromatic and deeply flavorful. Oh - and spicy, just the way I like it. For this dish, I used the book's roasted Jaffna curry powder, with dry red chiles, coriander seeds, peppercorns, turmeric, fresh curry leaves, fennel seeds, and fenugreek. Just a little more punch than Madras curry! I rubbed two tablespoons of this mixture on my lamb - along with a little Madras curry powder just to keep some semblance of the original recipe - and set it aside. Meanwhile, I sautéed a teaspoon of mustard seeds and a sprig of fresh curry leaves (not related to curry powder at all, fresh curry leaves are nutty and buttery and lend an unmistakable note to any dish) until crispy, added three hot green chilis (with seeds) and an onion, then fresh ginger and garlic. Next I added the lamb and cooked until it was brown. I tossed in some red potatoes and 3/4 cup of water and simmered for about 30 minutes. Instead of Dorie's apples and figs, I added coconut milk and simmered until everything was tender. To serve, I squeezed some Kafir lime juice over the top - this was another gift from Poppa Trix's co-worker, the same person who gifted us with those amazing finger limes awhile back. Pretty, pretty limes! In the meantime, don't forget to check out my current giveaway - a case of Pitaya Plus dragon fruit juice. And if you'd like to become a Dorista, just pick up a copy of Around My French Table and get cooking! Trixie-fied. That is just the perfect word for it! Heck yea! I was just checking out another FFwD and while it was beautiful, I was thinking that personally I'd like something that would smack me around a little harder. This is definitely it! 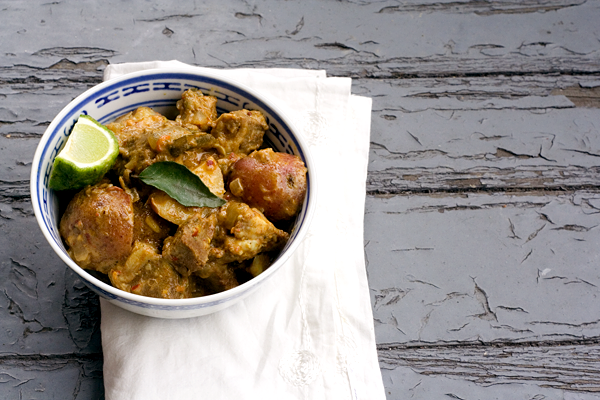 Those homemade curry spices sound amazing! This looks wonderful and the curry that you used sounds fabulous. I like your additions, especially the coconut milk. It just looks and sounds so delicious. Darling Trix, I love any kind of curry and yours looks terrific. Hope you're going to have a great weekend. Trix, your braised lamb not only sounds delicious but your photos are terrific. I figure, there's room in my mouth for the full spectrum of curryish dishes. I didn't expect any heat from this, so I wasn't disappointed not to get much. I was just happy it wasn't sicky-sweet, because I was afraid it would be. Yours looks great! Good job making it work for you! I have a bad habit of cooking exactly according to the recipe, even when I know I won't be happy with the result. I'm no good at improv in the kitchen. Sometimes I feel like you and I literally love the same kind of food. I would totally make this. This is just gorgeous. I admire your version with your blend of fresh grind spices! The finishing touch of keffir lime juice sounds heavenly to contrast the richness of coconut. Thanks for sharing your rendition of this dish! You sound like you know your spices, nothing comes close to fresh ground. I do not do it all the time but once in a while when I want to make something really special. That sounds like exactly what you did here, love your spin on this recipe. Yum! You have some great ideas to make this your own...look delish. And your fresh spices sound so good. Love the idea of coconut milk and lime juice. Loved reading your post. Wonderful changes I agree. It seems like the original recipe was designed for the shy palate. Very nice curry. i can tell you are a curry type of gal! I would love a taste of your unique curry, the spices sounds just perfect together. I like your take on this curry - all of the changes sound devine. OMG the addition of coconut milk was genius! I can't wait to give that a go! I did add the apples and figs and found that I didn't like the one bit of apple I tasted, however I loved the overall flavor of the dish. I must be in the dark ages with foods, never had curry anything, but lamb rules, so I am sure I would like it although that color throws me a little. Not use to lamb not being crispy browned... love that fat! Yo, mama! 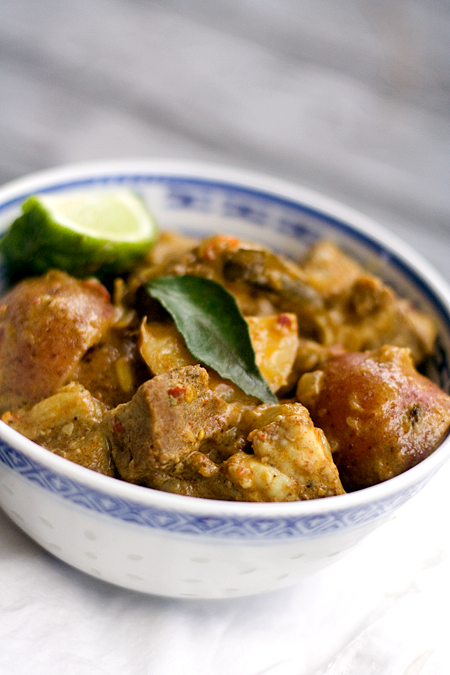 You used fresh curry and curry leaves.... and coconut milk and kaffir lime! So glad you turned this recipe on its head, it's not very French at all but who the hell cares? It looks so *bleeping* delicious! Maybe you should start a Rice & Curry cooking group, but not on a Friday because I love my French Fridays :). As for the desserts, I LOVE South Asian sweets so I'm looking forward to your giveaway. It better include your international readers, girlie! Needless to say, you had other ideas indeed! I'm sure the other version was Dorific but I have to say that I think I would rather have this dish Trixified than any other way. And lord woman you do know your way around the spice counter! Trixified indeed. Why not? It sounds great! The coconut milk is a great twist. The curry looks really flavoursome and inviting. 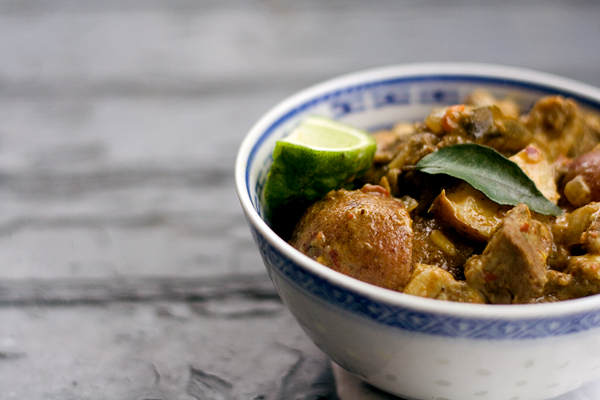 Lovely curry and we will drool over this, all the more lamb and curries are super hit at home. All the Indian spices would have oozed out a yummy taste I bet. I agree - there's nothing like freshly made curry, though I do keep some tinned stuff on hand for occasional use. 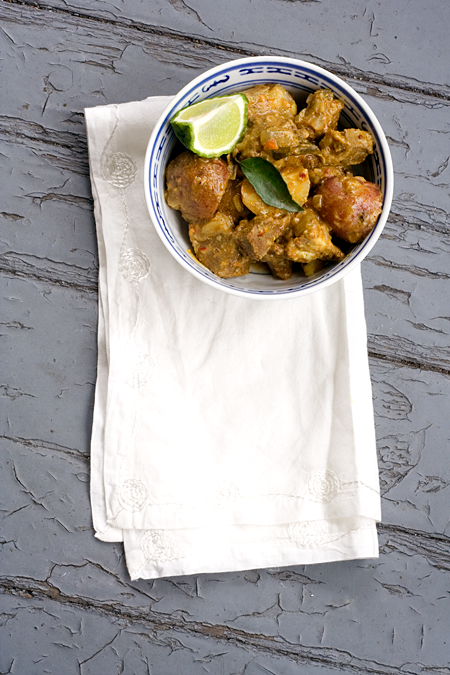 No purist, I.
I love the sound of your lamb curry, though I enjoyed Dorie's version, too. This looks so good! I love a good curry dish. love your variation! The lime sounds great! Also love your background! Lamb is my favorite meat, but never tried it in such a version. Sounds so flavorful and scrumptious! All I can say is wow! Okay, I can also say beautiful photos and I love how you made this your own. I would love an invite to your house for dinner. For sure, the Trixie-fied version is the best! Your spice blend sounds incredible for the flavors, the addition of kafir lime juice is really neat! Hello gorgeous photos! I don't even want to go back and look at my post! what a fun french dish to try- looks like you mastered it wonderfully! Wow Trix, great to see your dish and fun to read all the comments! I have to get back in the FFWD groove sometime soon, miss the recipes and the Doristas.